If poultry are expected to remain healthy and productive, they must consume adequate amounts of all the necessary nutrients. The quantity of each required nutrient varies depending on many variables like species of bird, age, productive state, environmental conditions and disease status. Fortunately, many nutritional deficiency problems can be identified by the unique symptom each exhibits. Discussions in the answers and publications that follow will help increase the poultry caretaker's understanding of the birds' dietary needs and improve the nutritional health of the flock. Why do my birds have an absence of feathers on parts of their bodies? Why do my hens lay eggs with thin or soft shells? Calcium is the primary mineral that makes up eggshells and when not supplied in the diet, the hen does not have the basic materials needed to make the shell. The problem is produced when whole grains or feeds deficient in minerals and vitamins make up the bulk of the laying hen diet. 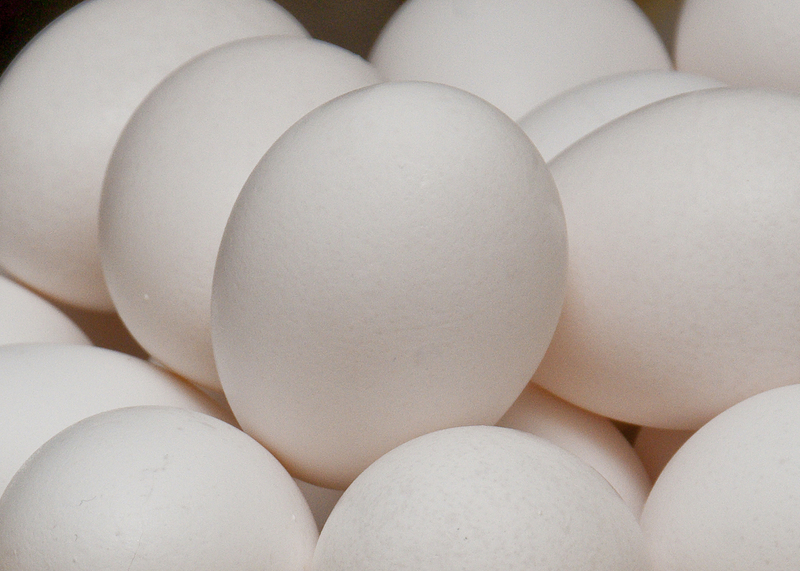 Thin egg shells are observed when calcium, phosphorus and vitamin D3 are not provided in diets at adequate levels. It is more often observed during periods of hot weather because calcium is conserved and retained within the hen's body less efficiently. The quality of the shells is improved by feeding a complete laying ration as the only diet. This diet supplies all nutrients in the proper proportions so the hen can produce good shells. If thin egg shells becomes a problem, it is advisable to add 2 pounds of oyster shells (as an oyster shell flour or hen-sized oyster shells) to every 100 pounds of complete layer ration. This will provide a quick remedy to the problem and should restore egg shell quality within a short period of time. After the egg shell quality is restored, the addition of oyster shell can be eliminated and the complete layer diet can then maintain good egg shell formation. It is also advisable to also add a vitamin supplement to the drinking water while the oyster shell is being added to the feed. This will help ensure that calcium and phosphorus in the diet is being properly absorbed through the digestive system and will be available for deposition as shell on the egg. My laying hens look healthy but many are not laying and some hens that are laying suddenly die. What is wrong? This problem is commonly referred to as Fatty Liver Hemorrhagic Syndrome. It results when large amounts of fat is deposited in the hen's liver and abdomen. The liver becomes soft and easily damaged and is more prone to bleeding. The liver contains many blood vessels that rupture easily during egg laying, resulting in massive bleeding and death. When laying hens are fed diets containing high levels of dietary energy the hens tend to deposit excess energy as fat deposits in their bodies, especially the liver. The problem is more common when feeds containing high levels of corn or other high energy ingredients is fed. Therefore, it is not advisable to feed chopped corn as the sole feedstuff to laying hens. The condition is most often seen in birds that appear to be healthy and in a state of high egg production. Non-laying hens will not eat as much of the high-energy feed and therefore are not affected as much as high producing hens. The problem can be prevented by feeding complete layer diets that contain the proper amounts of all nutrients. Corn is an excellent ingredient for poultry diets, but should not be fed as the only feed for hens. Therefore, do not feed corn as the only feed or in combination with complete feeds. A more detailed discussion of the condition, its cause and prevention is discussed in Diseases of Poultry under the topic of Miscellaneous (Nutritional) Diseases. Why do many of my growing birds develop a single twisted, crooked leg? This condition is observed only in young growing chickens, usually those under six weeks of age. The twisted leg condition is referred to as "perosis" and is caused by a nutritional deficiency of a vitamin named "choline." This vitamin is important in the formation of cartilage that maintains the stability of the hock or ankle joint. Perosis appears in only one leg of each affected chick. It is a completely different problem than when both legs are damaged, as in "spraddle legs." Spraddle leg is commonly caused by injuries that a chick receives when other chicks pile upon it or when the chick is placed on slick flooring soon after hatching. Older chickens do not suffer from perosis because the bodies of mature birds develop the ability to manufacture or synthesize choline, but young chicks cannot. It is important to provide starter and grower diets that contain adequate amounts of all vitamins, especially choline. Water containing vitamin supplements will ensure that perosis does not develop in young chicks. 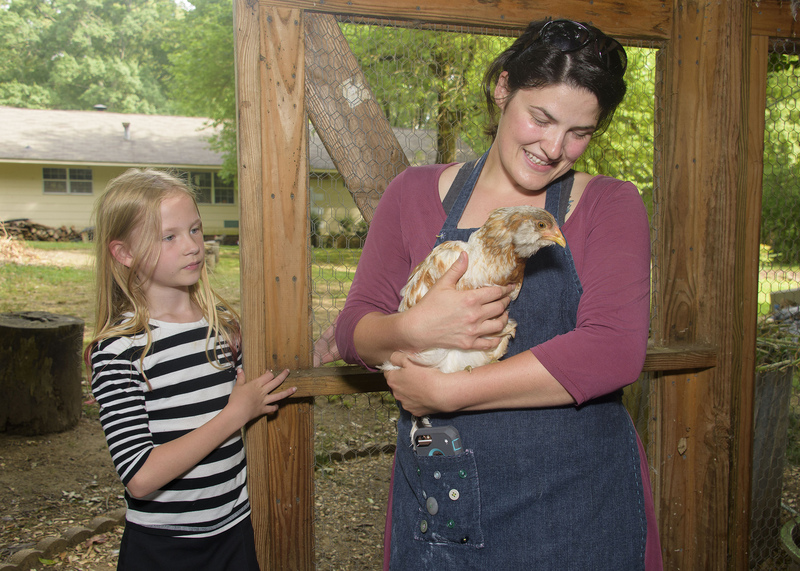 What medications should I have in my chicken feeds? Poultry feeds are available with several types of medications for preventing or treating diseases. Coccidiostats and/or antibiotics are the two most common medications added to feeds. Coccidiosis is hard to control by sanitation practices alone. It is best prevented by feeding a coccidiostat, which is a drug added to feed at low levels and fed continuously to prevent coccidiosis. Feed broilers a ration containing a coccidiostat until the last week before slaughtering. Feed an unmedicated feed during this last week. Mature chickens develop a resistance to coccidiosis if allowed to contract a mild infection of the disease. 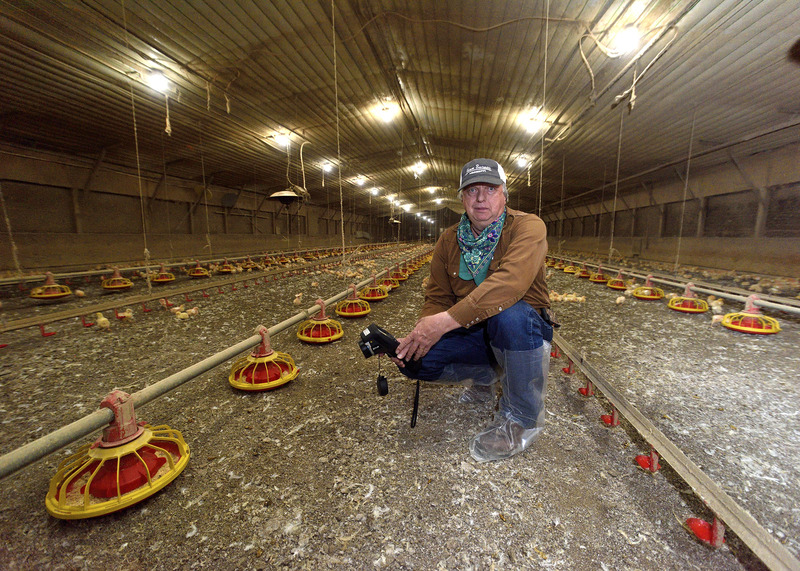 Birds raised for placement in the laying flocks are fed a coccidiostat feed until about 16 weeks of age. The medicated feed is then replaced with a nonmedicated feed. Spotty outbreaks of the disease can be controlled by treating in the water with an appropriate coccidiostat. Examples of coccidiostats added to the ration include Monensin sodium, Lasalocid, Amprolium, and Salinomycin. 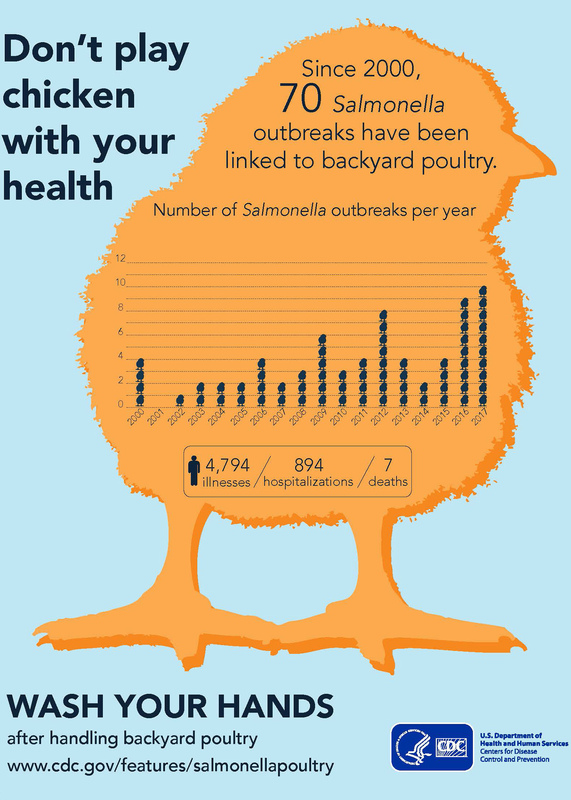 Antibiotics may also be added to some poultry feeds. 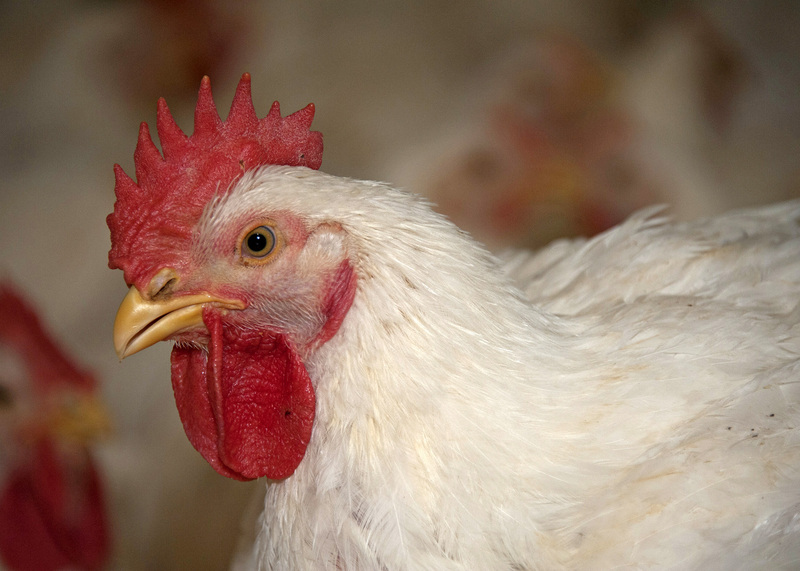 Antibiotics aid broiler performance and maintain healthy birds. They are usually added at low (prophylactic) levels to prevent minor diseases and produce faster, more efficient growth. Higher (therapeutic) levels are usually given in water or injected into the bird. Examples of antibiotics fed in the feed are Penicillin, Bacitracin, Chlortetracycline, and Oxytetracycline. Follow the recommended medication withdrawal periods before eating meat or eggs from the treated birds. Follow all warning instructions listed on the feed label. What types of feeds should I offer to my chickens? Poultry feeds are referred to as "complete" feeds, because they are designed to contain all the protein, energy, vitamins, minerals, and other nutrients necessary for proper growth, egg production, and health of the birds. Feeding any other ingredients, mixed with the feed or fed separately, upsets the balance of nutrients in the "complete" feed. Feeding additional grain or supplement with the complete poultry feed is not recommended. Feed chicks a "starter" diet soon after they hatch. Continue feeding the starter feed until they reach 6 or 8 weeks of age. The starter diet has the highest level of protein a chicken receives during its lifetime. As the chick matures, it requires a lower percentage of dietary protein and a higher level of energy. After the chicks reach 6 or 8 weeks of age, feed them a "finisher" diet (to broilers) or a "developer" diet (to pullets or cockerels saved for breeding purposes). Feed broilers a finisher diet until they reach slaughter size. Feed the pullets and cockerels a developer until they are at least 20 weeks of age. When egg production starts, feed them a "layer" ration until egg production ends. The minimum requirements for protein, calcium, and phosphorus in poultry feeds are shown. Remember, chickens saved for egg production are fed pullet-type diets, not broiler diets, regardless of being from broiler or egg-type stock. Should hens be full-fed or meal-fed and how much should they eat? The accepted feeding rules indicate that full feeding (offering a constant supply of feed) is the best method for attaining maximum production. When hens are restricted from consuming all the feed they desire, they usually cease laying eggs. An average laying hen will consume about 1/4 to 1/3 pound of feed per day depending on weather conditions, size of the bird, and level of productivity. Offer only a high-quality layer ration without any extra additions of grain or other feedstuff. The layer diet has all nutrients in the proper proportions to maintain maximum productivity in the birds, when allowed to eat all they desire. Be sure to offer only fresh, clean feed in the feed troughs. Can whole soybeans be fed to poultry? There are many types of beans including soybeans that are used as ingredients in bird diets. In general, all beans and peas are good protein and energy sources for birds. The primary problem with their use is that they must be processed prior to feeding. Most are members of the legume family of plants. One characteristicof these plants is that the fruit (beans) contain enzyme inhibitors that interfere with the digestion and utilization of nutrients in the diets. If beans are used, they must be roasted or steamed to destroy the antinutritional factors. All commercial soybean meals are processed in this way before being sold as feed ingredients. Raw soybeans should never be fed to poultry or game birds. 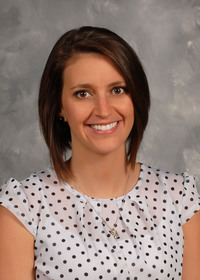 Nutritional research has been conducted on almost all commercially produced beans to determine whether they can be used as poultry feed ingredients.  Contact the Extension Poultry Specialist to confirm whether specific species of beans can be used and under what conditions. Where I can find information about feeding game birds? See Extension publication #2383 Feeding Quail.